LA PUENTE — Claremont knew was it was getting against top-seed Bishop Amat in the CIF Southern Section Division 3 girls soccer semifinals on Tuesday, a team that had scored over a 100 goals on the season, and had a 41-goal scorer in Stanford-bound senior Sophia Serafin, who knocked in six goals in the quarterfinals. But Claremont had a plan, and it worked to perfection, scoring early and holding off Bishop Amat and Serafin 1-0 to advance to the championship against second-seed South Torrance, a 5-2 winner over Flintridge Prep on either Friday or Saturday. The dates and times of the final will be released Wednesday. Claremont’s Oxsana Sosnovsky sent a long throw in front of Amat’s goal in the 20th minute, and somehow Mackenzie Boulware emerged from the crowd to score. The lone goal stood up, but Claremont (23-2-2) had to withstand a flurry of Amat (24-4) chances, especially in the second half. How rare is a shutout over Bishop Amat? It was the first all season, and snapped Amat’s 14-game winning streak. Claremont central defenders Hope Hyland, Katie Weaver and a host of others shadowed Serafin throughout, but Serafin was not without her chances. She nearly tied the game on two headers minutes apart early in the second half, and was tripped-up for a penalty kick in the 65th minute, but she missed the penalty, steering it wide right. Amat has lots of weapons, but clearly the focus was Serafin. The Wolfpack really had to roll up their sleeves the final 10 minutes after losing sophomore forward Sophie Jones to a red card, but still hung on with 10 players. Jones will have to sit out the final because of the ejection. Ironically, Claremont’s last title came in 2012, beating Bishop Amat 2-0 in the championship. 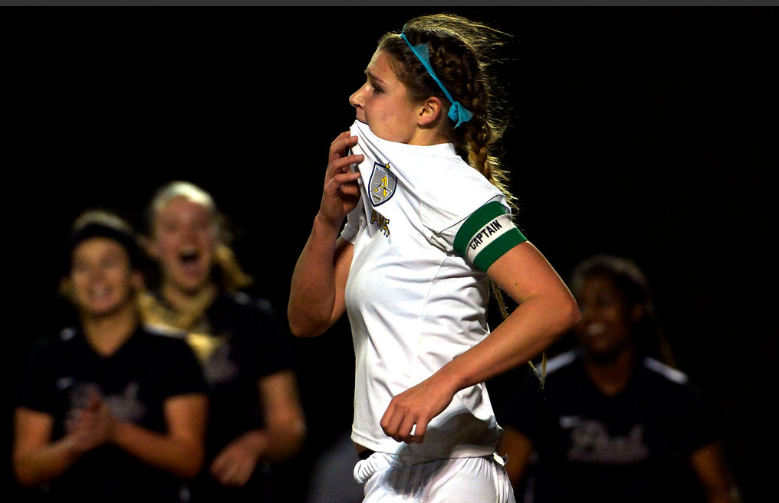 “These girls worked so hard, they deserve the opportunity to play for a title,” Tracey said. ONTARIO >> Northview High School’s Eddie Flores and Jackson Serna were two of the top wrestlers in the area at their weight class all season and the duo lived up to that billing Saturday.Both scored individual titles to lead the area efforts at Saturday’s CIF Southern Section Masters Meet at Citizens Business Bank Arena. The area qualified 11 competitors for next week’s CIF State championships at Rabobank Arena in Bakersfield. Area power Northview, which won its 14th divisional title last week, finished second with the two champions and six total qualifiers. St. John Bosco, with nine qualifiers, was first. The other area qualifiers were Northview’s Dominick Arellano (113 pounds, third), Gabriel Cortez (132, sixth), Ricky Marin (138, fourth) and Steven Comstock (170, fourth); Rowland’s Richard Rojo (106, sixth) and Armando Murrillo (132, eighth); Bishop Amat’s Sidney Flores (120, third), Charter Oak’s Joaquin Garcia (152, fifth) and Santa Fe’s Ronny Peraza (152, seventh). Serna, the No. 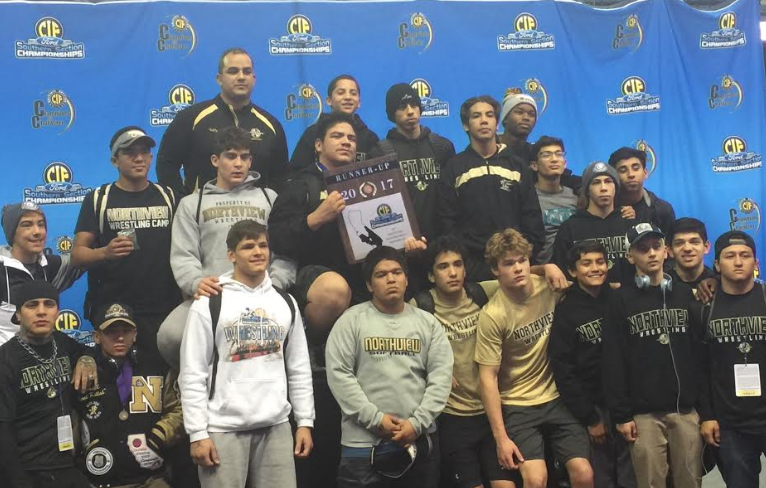 6 heavyweight in the state by The California Wrestler, won a Masters title for the second consecutive season. He was steady in following up last week’s win at the Inland Division championships, scoring four wins by decision and one by fall. He beat Sultana’s Austin Gillham 2-1 in a final. Gillham is ranked No. 7 in the state. He took a 2-0 lead in second period with an escape and penalty point before holding on for the 2-1 victory. “It’s great,” Serna said. “To be two-time Masters champion is amazing. But it’s not what I train for. I train to be state champion. Eddie Flores was also a repeat winner, taking the 106-pound title with a 7-2 win in the final over Downey’s Jonathan Prata. Flores is ranked No. 1 in the state. He used n takedown and an escape for a 3-2 lead before getting a takedown and nearfall in the closing seconds for the five-point decision. Sidney Flores was a strong third at 120 after finishing fourth at last week’s Central Division championships. He lost to Santa Ana Calvary Chapel’s Luciano Arroyo in the quarterfinals on Friday before going 3-0 on Saturday, including a 10-4 decision over Alta Loma’s Alex Nunez in the third-place bout. Northview’s Angelina Gomez won at 101 pounds to lead the area. Gomez defeated Riverside King’s Marissa Ritchie, 6-0. Glendora advances to title game: There are five CIF basketball championship banners hanging in the Glendora gym, all for the boys.The Glendora girls team will have a chance to put one of their own up next week after knocking off Pacifica (Oxnard) 62-52 in a CIF Southern Section Division 3AA semifinal game on Saturday night. The Tartans (25-5) will play Thousand Oaks, a 50-40 winner over Bishop Amat, on Friday or Saturday at a time and place to be announced by on Monday. 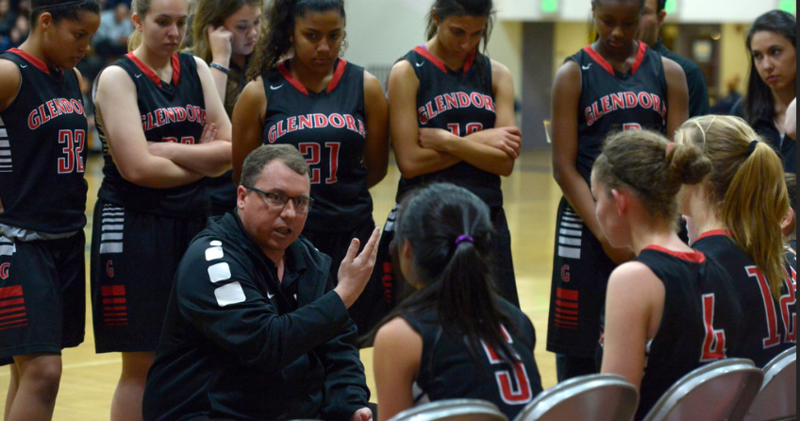 The Tartans broke a tie at the start of the fourth quarter with an 11-2 run to take control of the game. “It took us three quarters to finally figure out what to do to attack their press,” Nunemaker said. “Then it seemed like we scored on every possession. Michelle (Can) got us going in the third and Alex (Lowden) was her normal self. Rowland’s great season ends: After Camarillo made it to the CIF Southern Section finals in senior Cameran Bahnsen’s freshman year, she vowed to do whatever it took to make it back to the top before the end of her high school career. After one half of basketball on Saturday night in the Division 2AA girls basketball semifinals, it looked like Bahnsen might come up short in reaching that goal. But quickly into the second half, visiting Camarillo made it a reality as the Scorpions outscored Rowland by 17 points in the third period en route to their 70-55 road victory. Watch El Monte’s heartbreaking penalty kick loss on periscope. It was intense, El Monte had four PKs to win, but eventually lost 8-7 in 13 rounds. La Canada at Dunn, 3 p.m.
Diamond Bar comes up short: Diamond Bar High School has been one of the most proficient teams in the CIF Southern Section girls water polo playoffs this season. Tsui scored Diamond Bar’s final goal with 2:57 to play in the second quarter for a 6-3 lead. That was it. Baldwin Park 15, Rosemead 1 — Francisco Ruiz was the winning pitcher, striking out four, and Andrew Barboza had six RBIs for the Braves, who won their season opener. Also for Baldwin Park, Pablo Thompson and Jimmy Castro each had three hits. Pomona Catholic 8, Katella 3 — Dahlia Ramirez pitched seven innings, striking out six, and had an RBI and Bobbi Aguirre had three RBIs and a triple for the Pacers (1-0) at the Savanna Showcase. 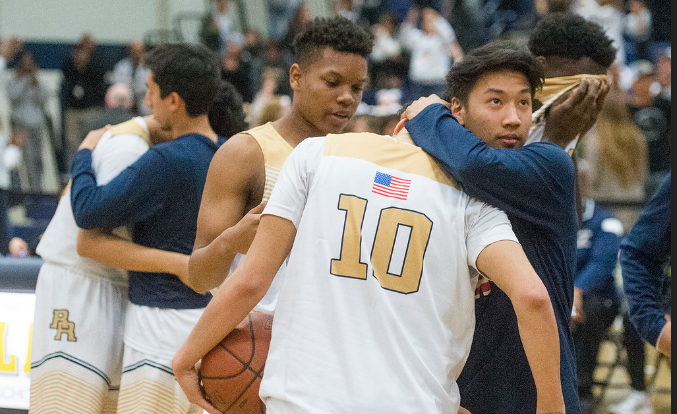 Rowland falls short in final seconds: One surprising CIF Southern Section boys basketball playoff run will continue. The other surprising run came to an end. Chino Hills loses in OT: The Chino Hills Huskies fall short to Mater Dei in overtime of the CIF Southern Section Open Division Semifinals, 83-80. LaMelo Ball was unable to seal the game for the Huskies with a 3-point attempt in regulation tied at 72. Damien at Redondo Union, 7 p.m.